This PDF 1.5 document has been generated by PScript5.dll Version 5.2.2 / Acrobat Distiller 10.0.0 (Windows), and has been sent on pdf-archive.com on 25/09/2016 at 05:56, from IP address 36.73.x.x. The current document download page has been viewed 346 times. File size: 43 KB (7 pages). Understanding of Shadows? Journal of Education and Learning. Vol. 10 (1) pp. 3440. 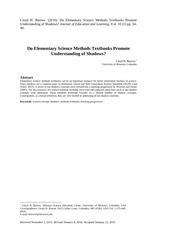 Elementary science methods textbooks can be an important resource for future elementary teachers of science. concepts were addressed. These methods textbooks focused on a limited number of shadow concepts. Consequently, as a future reference, they are very limited in addressing all ten shadow concepts. understand how a shadow is formed and seen. a barrier to their future students learning accurate shadow concepts. light, shadows, and darkness that teachers should not ignore. Lloyd H. Barrow. (2016). Journal of Education and Learning. Vol. 10 (1) pp. 34-40.
reflects, passes through or blocked (thereby creating a shadow). resources could clarify future teachers understanding and misconceptions about shadows. described in the subsequent paragraphs of where shadow concepts are described. investigation at different seasons and different months. Questions relate back to how sundials tell time. Do Elementary Science Methods Textbooks Promote Understanding of Shadows? puppets or using their hands to form animals. There is no section in this methods book on light. are provided for the teacher to stimulate students understanding of the link between shadows and time. Lederman, Lederman, and Bell (2004) has a sequence of eight pages focusing on shadows. cardinal directions. They use a stick figure which showed that shadow was touching stick figure. activity involved the construction of a shadow clock/sundial and checking its accuracy for several days. shadows are longer in the winter was also mentioned. Do shadows stay in one place? Predict the location of an object’s shadow three hours later. Why does a shadow move? This resource extends to middle school However, there is no recommendation about grade placement. teachers consider how to teach shadows. (1993) using cooperative learning strategies. (Keiley, Eberle, &amp; Dorsey, 2008). shadows in the astronomy chapter. study could identify which of the ten concepts are more difficult for teachers and students. The late Dr. Diana Hunn, University of Dayton, helped plan this research study. cultural approach, 2nd edition. Los Angeles: Sage Publication, Inc.
of Science Education, 31, 59-79. Science Education and Technology, 12, 263-275. Fehr, E. &amp; Rice, K. (1988). 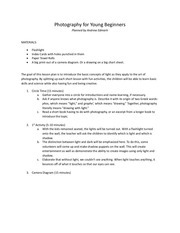 Shadows and anti-images: Children’s conceptions of light and vision II. Howe, A. (2002). Engaging children in science. Upper Saddle River, NJ: Prentice Hall. Keeley, P., Eberle, F., &amp; Dorsey, C. (2008). Uncovering students’ ideas in science, Volume 3. Lorbeer, G. (2000). Science activities for elementary students, 11th edition. Columbus OH: McGrawHill. principles of how people learn (pp. 421-474). Washington, D.C.: National Academy Press. Piaget, J. (1930). The child’s conception of physical causality. Science Education, 71, 629-39. Scott, P., Asoka, H., Leach, J. (2007). Students’ conceptions and conceptual learning in science. In S.
3rd edition. Boston: Allyn and Bacon. annual meeting of National Association of Research in Science Teaching, New Orleans. This file has been shared by a user of PDF Archive. Document ID: 00486766.